Specially designed for exterior use, this stylish solid teak door and frame are already oiled and ready to install. It can also be stained or finished for your choice of final effect. All joints are glued using tongue and groove and sloping joint connections for durability. Double-action hinges allow the door to swing both ways, while a dead bolt latch provides needed security. This item is the perfect finishing accent for your Cambridge Outdoor Living Space! 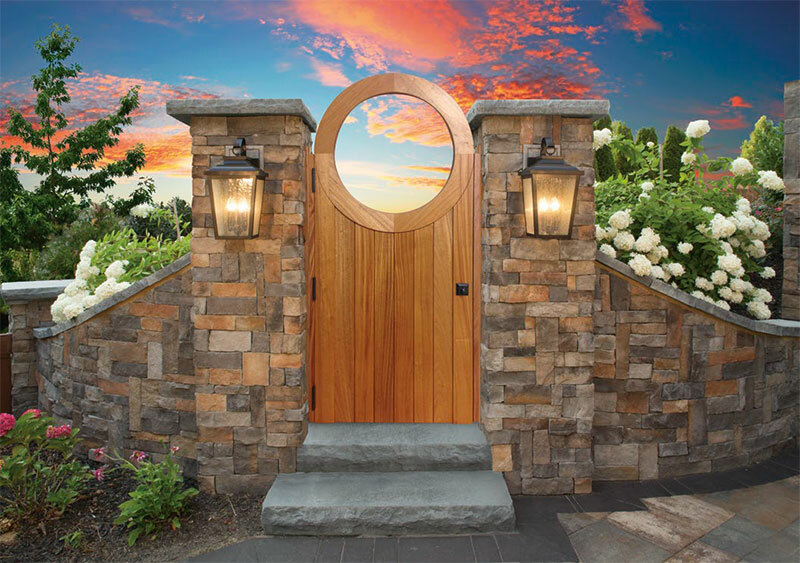 Add privacy to a perimeter wall by securing the door between two columns built from any style Cambridge Wallstones as shown. Dimensions: 38" wide x 80" high including the dramatic, 28"-diameter, circular opening at the top.